Frequent Bay Crossings readers may already be aware of the controversial Orcem/VMT cement factory and deep-water terminal project that has been proposed for the old Sperry Mill site at the entrance of the Mare Island Strait leading to Vallejo's waterfront and the Napa River. Frequent Bay Crossings readers may already be aware of the controversial Orcem/VMT cement factory and deep-water terminal project that has been proposed for the old Sperry Mill site at the entrance of the Mare Island Strait leading to Vallejo’s waterfront and the Napa River. We have previously covered our objections to the project. Opposition to the project has been mischaracterized as anti-business. 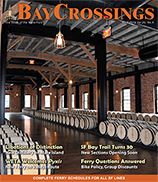 This month, however, we are happy to present the story of Savage & Cooke, the kind of business that will help Vallejo, and Mare Island in particular, to grow and prosper into the destination location that many residents have desired for years. And leave it to a visionary like Dave Phinney to lead the way. The Savage & Cooke Distillery consists of two large buildings that were an important part of the United States Naval Shipyard on Vallejo’s Mare Island that closed in 1996. The north building was a parts facility, while the south building functioned as an administration building with a vault where sensitive government documents were stored. The two buildings are connected by an elevated walkway that links the second floors. The area between the buildings was also the former location of the winch house for the gantry system that was used to pull ships and submarines out of the water for servicing as well as launching new vessels built on Mare Island. I visited the location recently and was greeted by Jordan Via, who is the master distiller and his assistant Dylan Carney. With a background as a chemical engineer, Via started in the wine industry before moving to distilling 15 years ago at Stillwater Sprits in Petaluma, which he ran for almost five years. He then became an instructor for the American Distilling Institute. Via then ran a distillery in Breckenridge, Colorado for 10 years before being hired by Phinney as a consultant to set up his new distillery on Vallejo’s Mare Island. “He wanted to do everything right and we took our time with every element,” Via says of Phinney, who has worked on this project since 2016. And, as often happens in the alcoholic beverage industry, Phinney thought there would be no one better to run his facility than the person who spent years consulting on the project and overseeing the procurement and installation of all the equipment. So Via was offered the master distiller position and moved to Mare Island in October. In just over 20 years, the native Californian Phinney has reached the level of success that would usually take a lifetime to achieve. Starting in the wine industry during the 1997 harvest at Robert Mondavi, Phinney founded Orin Swift Cellars just a year later, which introduced a blend of zinfandel, cabernet sauvignon, syrah, petite sirah, and charbono called “the Prisoner” that became a runaway smash hit in the industry. He eventually sold the winery to E.J. Gallo, who still employs Phinney to oversee the winemaking production. Phinney’s plans on Mare Island don’t stop with Savage & Cooke. There has been talk about bringing in a new winery, a rooftop bar, a restaurant specializing in fried chicken and a coffee roaster—along with studios for artists and more public parks. Phinney and his partners are considering restoring up to eight former shipyard buildings to facilitate his visions. Savage & Cooke’s products will have a distinctive local feel to them. The distillery is using natural spring water that is uniquely suited for making distillates brought in from a natural spring on Phinney’s property in Alexander Valley. All of the corn used is grown about an hour north of Vallejo in Winters, where the company has has contracted for over a million pounds of corn this year alone. The rye is also grown on that same land in the winter months and malted in Alameda. After the distilling process is complete, the 120-proof liquid is transferred to wine barrels to be aged five years for whiskey, four years for bourbon and three years for rye whiskey. On-site distilling began in late March, meaning the first barrels of product made on Mare Island will not be available until spring of 2022. However, the products being distilled now are created using the same flavor profile of the blends currently available. Speaking of the finished products, I was fortunate to be able to sample all of the Savage & Cooke products at my recent visit to the facility and was very impressed. Barrels of aged whisky and bourbon sourced from Kentucky, Indiana and Tennessee are hand-selected and blended at the Mare Island facility for a unique finishing process in wine barrels from Phinney’s projects in Napa Valley and Maury, France. The American whiskey and bourbon goes in cabernet barrels and the rye whiskey goes in grenache barrels before being bottled. And even the bottles are unique; they feature an opaque black matte finish and a custom molded tapered design with Vinoseal glass stoppers instead of cork or plastic seals. Oh, and then there is the tequila. Even before he came up with the Savage & Cooke project, Phinney made a connection with the Ramirez family in Jalisco, Mexico that runs a tequila distillery way up in the mountains—where the agave grown in high altitudes brings out a crisper, cleaner tasting tequila. He cut a deal to send his Chardonnay barrels to Mexico and ships them back filled with tequila. The tequila brand is called Ayate, with Reposado and Añejo versions available. Both are of exceptional quality, but I found the Reposado to be extraordinarily smooth and impressive. Savage & Cooke is located at 1097 Nimitz Avenue in the center of the newly designated Historic Core of Mare Island. It is currently open to the public for tours and tastings by appointment only Thursday through Sunday from 10 a.m. to 5 p.m., and is located just steps away from the Mare Island ferry terminal. For more information, visit savageandcooke.com or call (707) 388-1864.